A recent CNN post by Zak Smith, a lawyer for the notorious NRDC, insinuates that American consumers of popular seafood like canned tuna are complicit in the killing of whales. But the piece is inaccurate and incomplete in a number of ways. Smith writes that “91% of seafood consumed in the United States is imported and nearly every wild-caught foreign fish product sold in the U.S. violates the Marine Mammal Protection Act, endangering the lives of marine mammals around the world.” While the overwhelming majority of fish in the United States is imported (though most estimates peg it at 85 percent, not 91 percent), less than half of it is wild-caught. And of the amount that is wild-caught, tuna comprises a large—perhaps the largest—share. What Smith leaves out about the tuna Americans eat is that all of it is sourced from fisheries that follow tough, widely recognized dolphin-safe fishing practices. Moreover, alongside the International Seafood Sustainability Foundation and its global partners like WWF, the American tuna industry has worked to reduce the environmental impact of tuna fishing on other marine species. ISSF’s 2013 Stock Status Ratings show that 94 percent of all tuna comes from sustainable sources with minimum environmental impact. And ISSF and its partners will continue to work hard to improve on that record in the future. Sadly, this isn’t the first time the activist trial lawyers at NRDC have used scare tactics and faulty information to scare Americans away from safe seafood to sustain its own fundraising. And we’re sure it won’t be the last. Greenpeace’s John Hocevar recently took to Intrafish to log his response to a letter we wrote applauding reporter Cormac Burke’s November story “Leading From the Back Line” in which Burke admirably peels back Greenpeace’s rhetoric to look at the reality beneath the surface. Hocevar’s posturing response is sadly typical of the bombastic organization he helps run, and it further demonstrates how important it is for the seafood community and value chain to see Greenpeace for the paper tiger it is. 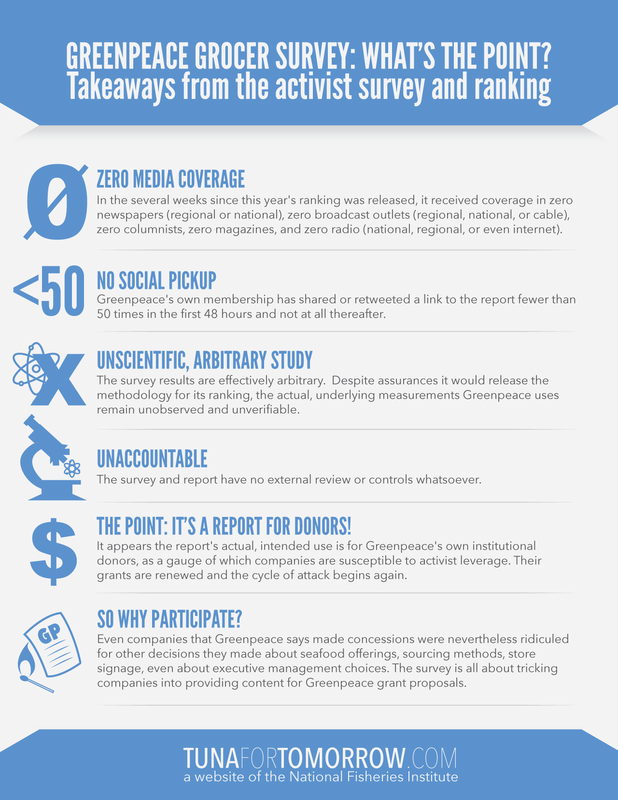 We asked whether Greenpeace ever conducted an environmental impact study on the fishing methods it advocates. That is, wouldn’t their sourcing scheme actually require more fuel, boats, labor, and resources to meet current demand than prevailing methods? They don’t say. And what about the economic impact on both companies and consumers of reduced supply? Greenpeace ignores that too. Is the Astro-turfing and harassment, in which Greenpeace enlists Internet followers to make crank calls reading from prepared scripts, an acceptable form of dialogue? Is it intellectually serious when they publish cartoon graphics with violent imagery that can readily be seen by children? Greenpeace has no answer for either. Those questions are not “misdirection,” as was lamely suggested. Indeed, they get to the very heart of the disconnect between real, roll-up-your-sleeves problem-solving and the manic fundraising effort necessary to keep a $700,000 a day organization afloat. With a straight face, Greenpeace insists on being taken seriously on tuna sustainability. Yet their “ocean campaigners” dress up as clowns and dance around in parking lots. They claim to have scientists on board their mega-yacht, yet they have never produced any empirical data on the environmental and economic impact of their demands, or on public opinion of their methods. While Greenpeace staffers are hosting hot tub dance parties and filming synchronized swimming routines (yes, really), a consortium of actual scientists, NGOs, and industry experts that are meeting to collaborate on maintaining the health of canned tuna stocks. As NFI has documented, it has been nearly 900 days since Greenpeace has had an open invitation to take part in those discussions, under the auspices of the International Seafood Sustainability Foundation. We are still waiting. Stripped of bluster, the only substantive assertion that remains in Hocevar’s letter is mere repetition of Greenpeace’s long falsified claims against the paper industry, in which Greenpeace cited “testing [that] shows the packaging used by leading toy brands regularly contains Indonesian rainforest fibre.” But in a published letter following Greenpeace’s splashy publicity stunt, the head of the lab they hired to conduct the testing rejected Greenpeace’s conclusion, writing: “[We are] only able to determine the types of fibres present in such samples. We have not, and are unable to identify country of origin of the samples. This type of assertion would need to be based on data outside of our findings. Therefore we are unable to comment on the credibility of the statements Greenpeace has made regarding country of origin.” Whatever “chain of custody research” Hocevar alludes to was never cited in its original press release (instead they misrepresented the lab’s findings), it is not linked in Hocevar’s letter, and it cannot readily be located anywhere on Greenpeace’s website. 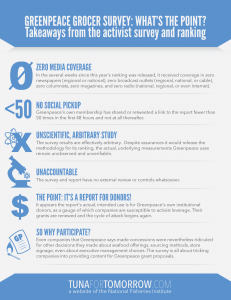 The final point in our original letter is one Hocevar offers no response to at all, so it is worth reiterating: from all the public opinion research that has been done, it is clear that consumers and the public can see right through Greenpeace, too. Today we give a well-deserved tip of the cap to the National Post’s Rex Murphy. In a recent column that’s well worth the read, Murphy surveyed the spectacle that Greenpeace has become, charting how the organization has evolved from a scrappy, ideological underdog to what Murphy terms a “corporate [fundraising] brand” unto itself. While Greenpeace used to be known for taking bold moves such as staging sit-ins at nuclear weapons testing grounds, Murphy writes, they now resort to protests directed at “gentle-minded, humane, risk-averse Western targets” in what amounts to “pure kabuki, [a] show without consequence.” Their goal: fundraising in an effort to replenish Greenpeace’s corporate coffers. But while it’s encouraging to see Murphy call out Greenpeace after decades of childish antics, his voice remains a lonely one in the broader media. The environmental press, in particular, can’t or won’t see what Murphy does, and indeed go out of their way to praise the accomplishments of Greenpeace, despite any evidence that their juvenile actions are having a positive impact on global sustainability efforts. In the world of canned tuna, for instance, the Greenpeace playbook is to make false claims about how tuna is sourced while refusing to join the global tuna industry in real sustainability dialogue. And where are the journalists asking Greenpeace to do an economic impact study for the highly inefficient, “throwback” pole and line methods they recommend for tuna fishing? How much more would a can of tuna cost for the families Greenpeace claims to be helping if tuna companies rolled back decades of technological progress? And who in the press is asking how many more fishing boats, spending how many more man hours and burning how much more fuel, would be required to meet global seafood demand under Greenpeace’s preferred fishing policies? Has any reporter demanded that their patron saints of environmentalism do an environmental impact study of their own preferred policies? When Greenpeace advocates for pole and line caught canned tuna, they’re also advocating for dramatically increasing the price—and carbon footprint—of one of the most nutritious and affordable foods available to Americans, plain and simple. And in a country that eats far less than half of the recommended amount of seafood suggested per week, giving in to Greenpeace’s policy prescription of catching fish one at a would be disastrous. Rex Murphy deserves a round of applause for seeing through the rhetoric and theater of Greenpeace’s demands and for recognizing that the organization is nothing more than an elaborate fundraising scheme We hope the rest of the media follows his lead and starts to ask Greenpeace the tough questions about their prescriptions for tuna sustainability. The latest attack from the shadowy Campaign for Eco-Safe Tuna and its hired gun Mark Robertson crosses the line from desperate to potentially dangerous. Robertson, a paid spokesperson, says the Campaign for Eco-Safe Tuna is “handing out information and asking people if they know what dolphin-safe means and what the impacts of dolphin-safe is on eco-systems.” But the truth is that Eco-Safe is backed by the Mexican tuna fleet and a number of Central American governments with direct financial interests in going back to the days before dolphin-safe tuna. Prior to 1990, fishermen caught yellowfin tuna by following dolphin, because the two could often be found swimming together, especially in the area of the Pacific ocean off the coast of Mexico and Central America otherwise known as the Eastern Tropical Pacific. Crews “fishing on dolphin” would chase dolphin using explosives or sonic pulses to round up dolphin and their tuna fellow travelers, and then intentionally encircle them with something called a purse-seine net—a net that hangs vertically in the water with weights at the bottom and floats at the top. The tuna were harvested for processing. The dolphin were “released”—dead or alive—as bycatch. This all changed starting in the late 1980s, when Americans and people around the world spoke out against the old ways and called for steps to be taken to protect dolphin. American tuna companies worked with the movement, and stopped buying fish caught by chasing dolphins. Congress went a step further, prohibiting the sale of canned tuna in U.S. markets that was caught by chasing and intentionally encircling dolphins. There is only one major tuna producing country that still does things the old way: Mexico. Fishing in the Eastern Tropical Pacific, Mexican tuna boats “fish on dolphin” to this day, chasing the mammals in speedboats, encircling them in their nets and releasing them when able, but still killing around 1,000 each year allowed under dolphin mortality limits. Because of this, Mexico can’t sell its tuna as “dolphin-safe” on the U.S. market, and both the Mexican tuna canning industry and the Mexican government are understandably very upset about that. They have even sued the United States in the World Trade Organization, in an attempt to get America to change its laws and return to fishing practices from the old days. The Mexican tuna fleet and its allies in government have enlisted Robertson, and his firm Potomac Global Advisers, to make their case to the public. And we can see why they need help. The simple truth is that, far from being concerned about the well-being of dolphin, Robertson and Eco-Safe are hell-bent on getting non-dolphin safe tuna sold on American shelves, twenty years after the Americans condemned it, the tuna industry moved away from it, and Congress banned it. No wonder they need to resort to desperate stunts and irresponsible attacks. We’ve heard plenty of scary but vague language about what the Eco-Safe tuna group is against. Now it’s time for them to fess up to what they are for: chasing dolphin. Leave it to Greenpeace to repackage all their scary messages and predictions about the future of tuna into a short list of yawners. In a recent blog list that alleges industry support for “some of the worst fishing practices tuna companies execute” Greenpeace twists and turns their claims every which way to frighten retailers and shoppers alike. Their haphazard tally includes the practice of “tuna ranching”—raising juvenile tuna species in ocean tanks rather than fishing for them in the wild—as the third worst offender. Except tuna ranching has nothing to do with canned tuna producers or the way we fish. Likewise, the number one bogeyman on this decidedly non-definitive list is the “overfishing” of Bluefin tuna. What they don’t tell you is that you won’t find any Bluefin in any “colorful cans of tuna on grocery shelves across the world. ” U.S. canners fish responsibly from skipjack and albacore tuna populations that are thriving, because nobody cares more about sustainable tuna than the people who depend upon it as a way of life. In fact, we invited Greenpeace 800 days ago to partner with the U.S. companies and the International Seafood Sustainably Foundation (ISSF) and we still have no answer. Do the activists at Greenpeace not know any better? Do they not care? Or are they intentionally misleading their contributors and donors? We do agree with one thing Greenpeace says in their list. “When what you do is hundreds of miles from civilization, it’s pretty easy to get away with some messed up stuff.” Indeed. And when what Greenpeace does is hundreds of thousands of miles from its donors, it’s pretty easy to get away with rhetoric of their own. That’s why we made a little list of our own. Who Does More for Sustainability: Greenpeace or the Fishing Industry?